Thousands of UK workers are being trained to help respond to a future terror attack as part of an updated counter-terror strategy, ministers say. 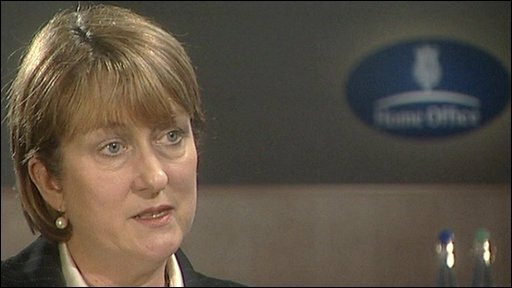 Home Secretary Jacqui Smith said shop and hotel workers would be among 60,000 people able to deal with an incident. The updated approach, aimed at tackling immediate terrorist threats and the causes of extremism, would be the most comprehensive in the world, she added. But the Tories said not enough action was being taken against extremists. The Home Office's new counter-terrorism document - to be published on Tuesday - will go into more detail than ever before in the interests of public accountability. It will reflect intelligence opinion that the biggest threat to the UK comes from al-Qaeda-linked groups and will also take into account recent attacks on hotels in the Indian city of Mumbai. Ms Smith told BBC One's Politics Show: "What we're completely clear about is that if we're going to address the threat from terrorism, we need to do that alongside the 60,000 people that we're now training up to respond to a terrorist threat, in everywhere from our shopping centres to our hotels. "We need to do it alongside the 3,000 police officers now working on counter-terror and we need to do it with international partners. "This is no longer something you can do behind closed doors and in secret." The paper - called Contest Two - will update the Contest strategy developed by the Home Office in 2003, which was later detailed in the Countering International Terrorism document released in 2006. Over the last six years the strategy has concentrated on preventing radicalisation of potential terror recruits to disrupting terrorist operations, reducing the UK's vulnerability and ensuring Britain is ready for the consequences of any terror attack. The updated strategy will increase the focus on challenging individuals and groups who undermine the UK's "shared values" - even if they are not breaking the law. Gordon Brown said tens of thousands of civilians had already been trained in how to look out for suspicious behaviour in crowded places and to react in the event of an attack. The prime minister told the Observer: "Today, not only the police and security and intelligence officers and our armed forces, but also the emergency services, local councils, businesses and community groups are involved in state-of-the-art contingency planning. "Tens of thousands of men and women throughout Britain - from security guards to store managers - have now been trained and equipped to deal with an incident and know what to watch for as people go about their daily business in crowded places such as stations, airports, shopping centres and sports grounds." While the paper will look into the lessons learned from the November attacks in Mumbai, it is not thought attacks are likely on hotels in the UK. The terrorism threat level, set by the Joint Terrorism Analysis Centre, has since July 2007 been "severe". Ms Smith said an attack was "highly likely" but stressed the UK was "much better" at identifying threats, particularly international ones, and foiling them than in the past. Shadow home secretary Chris Grayling welcomed some of the proposals but said too little was being done to tackle the "root causes of extremism". Earlier this week, the Tories claimed the government had failed to close down a single terror website since Tony Blair pledged action in 2005. "The government is not doing enough to deal with some of the groups who are potentially fostering extremism," Mr Grayling said. "We have really got to do more, I think, to stop some of the fostering of hatred that is still visible and present in our society." One terrorism expert said equipping people to react quickly to an attack in the workplace and in public areas was a "bold and imaginative" step. "There are thousands of people not only in the public sector but in the private sector also who have the necessary knowledge and skills to help in the constant vigilance that is needed against the terrorist threat," said Professor Paul Wilkinson, from St Andrew's University. By 2011, Britain will be spending £3.5bn a year on counter-terrorism, the Home Office has said. The number of police working on counter-terrorism has risen to 3,000 from 1,700 in 2003.